Coal scuttles were designed to store coal near the fireplace or stove where it would be used. A recent article by antiques experts Ralph and Terry Kovel suggested the scuttles could now be used to hold magazines, or to serve as small tables. 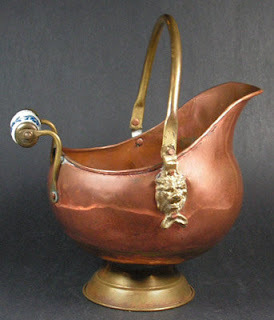 But when I look at pictures on the web (like the one above from GoAntiques.com), many of the coal scuttles I see seem like they'd be useful in sort of the same way some baskets are - for storing all sorts of things, from kitty toys to yarn.